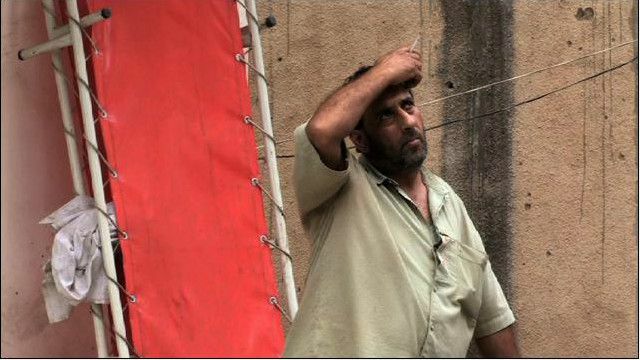 "My Neighbour, My Enemy" explores the daily reality of two communities caught up in a tragic cycle of sectarian violence in the Lebanese city of Tripoli. With unprecedented access to both sides of the frontline, this is the story of what happens when neighbours become mortal enemies. Tripoli is a city where the inhabitants of two local slums, one Sunni, the other Alawite, have been slugging it out since the 1970s. Like a couple locked in an abusive marriage, neither partner has the energy or will to escape this futile, bloody conflict. This is what Syria will look like if sectarian violence becomes a way of life. We explore this tragedy through two central characters; fighters on opposite sides of the line and different stages in their careers as men of violence. Abu Rami: 35 years a militia leader, a gunman since his teens…Who knows how many lives he’s snuffed out? It goes like that when you choose the life of a Lebanese gun-slinger, when you become, as he puts it “…a bit brutal.” But now he has been finished off – by love. By fatherhood. Sheikh Bilal is also a killer. But unlike the war-weary Abu Rami, his blood is boiling. He thinks that the slaughter in neighbouring Syria will lead to the overthrow of the Assad regime that back in the 1980s murdered his father. When that day comes, Bilal's sure the Sunnis can rid Tripoli of the “non-believers,” as he calls his Alawite enemies. Every few weeks armed clashes erupt and the neighbours attack each other with sniper rifles, machine-guns and rocket launchers. People die and homes burn. Then the guns fall silent. Both sides bury their dead and prepare for the next time. In Tripoli there is always a next time.